Tokyflash have unveiled their latest creation the Tokyflash Kisai Maze, a blend of visual trickery and stainless steel the Maze has been created to keep you on your toes whilst still making sure you're on time. Featuring an 'Always on' LCD the Maze feeds you the time using an intricate maze of LCD blocks that according to Tokyoflash is actually surprisingly easy to see at a glance. If however you're in a rush or it's a Monday morning press a button on the side and it'll instantly switch to a more neuron-friendly timepiece. 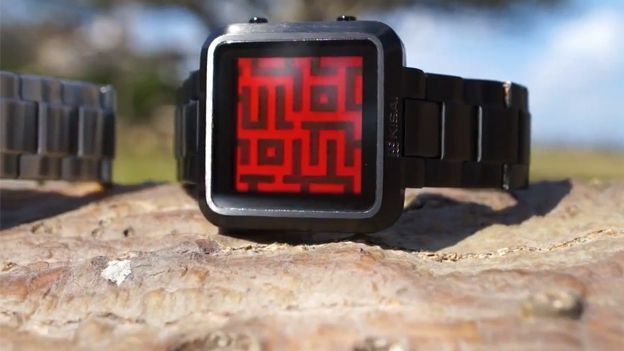 Naturally it features a backlight coming in an array of colours and an alarm function. If the Maze is for you it's available now from Tokyoflash at £61.39 and comes in Silver or Brushed Black and despite the chunky size is only 130 grams. Check out our feature showing you the best watches to buy in 2012 and kit yourself out with the finest time-keeping devices available today.